I’ve read various books about hair over the years and found them helpful in developing healthy hair care practices. Recently, I picked up Curly Girl, The Handbook for the first time. The first version of this book came out about ten years ago but the one I bought was the updated version with expanded information and a lot of new materials. Don’t use sulfate-based shampoos or any products containing silicone. Those were the first things to go when I started my healthy hair journey. Style your hair by scrunching with a non-drying gel after washing. My all-time favourites are Ecostyler Argan Oil Gel and Quidad Climate Control Heat & Humidity Gel. For me, the argan oil gel gives more hold and the climate control gel makes my curls pop. Air-drying your hair, or using a hair dryer with a diffuser attached. I go for air-drying as I don’t have the patience to use a hairdryer. The Curly Girl Handbook includes seven different categories of curl types – waves, loose curls, tight curls, s’wavy, wavy, cherub, botticelli, corkicelli, corkscrew, and fractal or zigzag as well as ways to identify your curl type. The book also offers a simple and straightforward pinecone explanation about the hair cuticle. The section on products and home-made recipes is a gem. I was intrigued with the Scrub me the Right Way exfoliating cleanser recipe, which is a perfect fit for the unused packet of quinoa in my kitchen cabinet. I also loved the versatile lavender spray recipe which I will be trying ASAP. These are just two of the fabulous sounding home-made recipes in the book. Sprinkled throughout the book are several “curl confessions” from curly haired readers who eventually learned to let go of harmful hair practices and embrace their glorious curls. Though the author is the owner of a product line, she didn’t try to push this in the book and was open about what to watch out for in hair products, which lends more credibility to the information contained in the book. 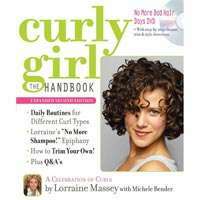 Also included with the Curly Girl Handbook is a 25-minute DVD with various techniques demonstrated. For someone who finds styling a challenge, this is quite useful including the chapter on how to trim your own hair. There’s also a great section on curly Qs & As at the end where common questions are answered extensively. 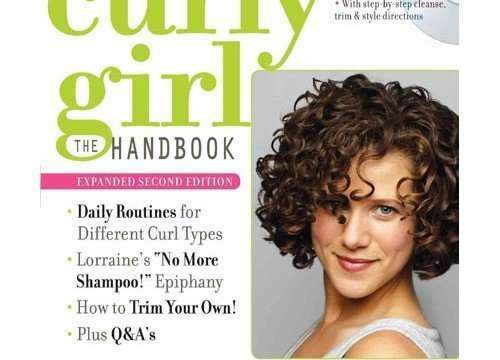 Overall, the Curly Girl Handbook was a fast read and contained comprehensive information every curly hair girl needs to know. I highly recommend it if you are new to the world of embracing your curls. Get your copy HERE. 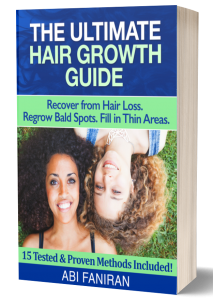 If you enjoyed this post, you’ll be interested in The Ultimate Hair Growth Guide, a comprehensive tool for recovering from hair loss, regrowing bald spots and filling in thin areas of your scalp. Learn more and grab your discounted copy HERE.